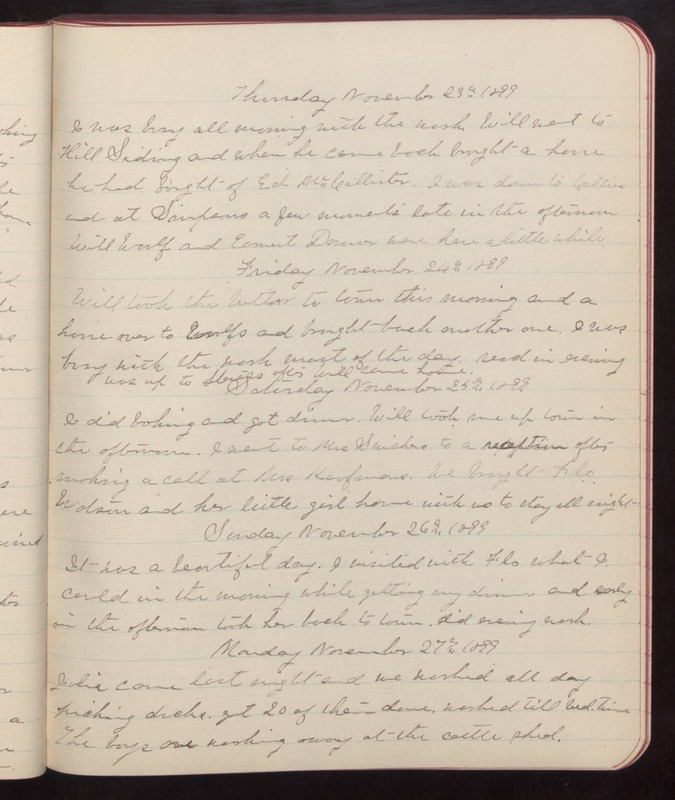 Thursday November 23rd 1899 I was busy all morning with the work. Will went to Hill Siding and when he came back brought a horse he had bought of Ed McCallister. I was down to Callies and at Simpsons a few moments late in the afternoon Will Woolf and Earnest Donner were here a little while. Friday November 24th 1899 Will took the butter to town this morning and a horse over to Woolfs and brought back another one. I was busy with the work most of the day. read in evening was up to Stevens after Will came home. Saturday November 25th 1899 I did baking and got dinner. Will took me up town in the afternoon. I went to Mrs Swishers to a reception after making a call at Mrs Kaufmans. We brought Flo Watson and her little girl home with us to stay all night. Sunday November 26th 1899 It was a beautiful day. I visited with Flo what I could in the morning while getting my dinner and early in the afternoon took her back to town. did evening work. Monday November 27th 1899 Julia came last night and we worked all day picking ducks. got 20 of them done. worked till bed-time The boys are working away at the cattle shed.